Day 1: John hasn’t shown any ill-effects yet. Will up the dosage tomorrow. Day 3: That was a dead end. He’s quite perceptive when he wants to be. Pity that’s not more often. Day 4: You’d think he’d be used to me putting things in his tea by now, but no. He got offended. I don’t get it. Day ?? : Haven’t seen John in a week (two weeks?). His desk looks clean, so he was probably here at some point. He’s still not speaking to me, but I’m sure that won’t last. I do hope he’s not dating that irritating woman that was here the other day. Sherlock Holmes is one of the greatest minds in all of literature. He also happens to be one of my favorite fictional characters and, as it turns out, an INTJ. 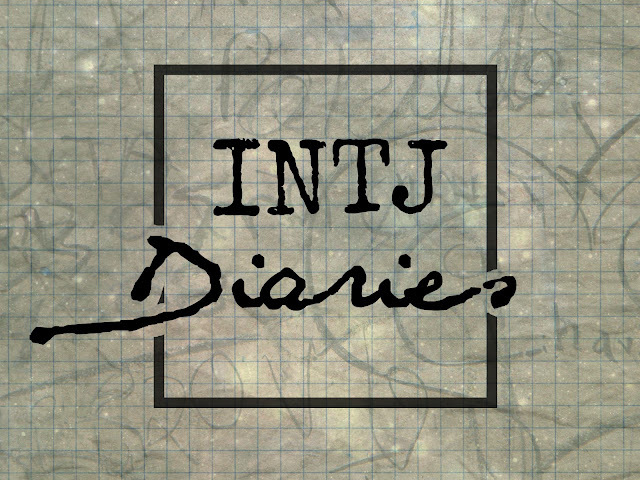 (This post will reference mostly Benedict Cumberbatch’s portrayal of Sherlock Holmes, though I believe the Sherlock Holmes in Sir Arthur Conan Doyle’s original stories was also an INTJ. But that's neither here nor there.) I've seen him typed all over the place--ISTP, ISTJ, ENTP--but, most commonly, the argument is, “Is Sherlock an INTP or an INTJ? ?” People get pretty heated. Welcome to the Internet. An INTJ, like all Myers-Briggs types, is broken down into four functions, ours being: introverted intuition, extraverted thinking, introverted feeling, and extraverted sensing (Ni-Te-Fi-Se). Introverted intuition is the dominant function--the one that governs all our thought processes. It manifests itself in puzzle solving and seemingly psychic predictions that nearly always come true, since we’re always taking in information and analyzing it, sometimes unconsciously. The auxiliary function--the one that takes the primary function and helps it interact with the world--is extraverted thinking. This is the logic-above-all-else attitude that makes us both seemingly brilliant and great villains: it takes everything we see and experience in the world and sorts it into nice little boxes stuck in a spiderweb to pull out anytime we need it (usually for solving a puzzle or proving a point). Te takes all the conclusions that Ni comes to and puts them together into coherent arguments. Often rapidly, while we’re arguing or ruminating on a problem while others are talking about it. There is no way he's an ISanything. The tertiary function--introverted feeling--is the “weakness” function. It’s underdeveloped and thus often ignored. Introverted feeling is concerned with personal principles and being in touch with one’s emotions, which--since we’re not very good at it--most INTJs view as a weakness. Hence the reason we come off as cold, emotionless robots. We like it that way; it’s easy that way. We have emotions, and we definitely have principles, but we put them aside for the sake of logic and fit them into our personal schema later. Extraverted sensing is the inferior function. It’s the one that makes us most easily overwhelmed and, when we’re tired or stressed, will come to the forefront and cause us all sorts of problems. Extraverted sensing is concerned mainly with noticing and absorbing sights, sounds, smells--anything that uses the five senses. So we’re overwhelmed when assaulted with sensory overload, and when we’re stressed, we abuse substances or do really stupid things, just to sense something. Hence Sherlock’s nicotine (née cocaine) addiction. And his need for quiet. So that’s Sherlock. He suppresses his emotions, he abuses substances, he often forgets what day it is when absorbed with a project, and he solves puzzles with objective facts. Robert Downey Jr’s portrayal of Sherlock Holmes is generally agreed to be an ENTP, which only strengthens my case that Benedict Cumberbatch’s is an INTJ. 1. An INTP would know that the earth revolves around the sun. An INTP is broken down into introverted thinking, extraverted intuition, introverted sensing, extraverted feeling (Ti-Ne-Si-Fe). Introverted thinking is concerned with theories and ideas. Extraverted intuition takes information and strengthens those theories until they're practically foolproof. An INTP would know that the earth revolves around the sun. Most INTJs would, too, for that matter, but we’re less likely to care because what effect does it have on our day to day lives? And the less we care about it, the less likely we are to file it away for later use. 2. An INTP wants harmony. An INTP’s inferior function is extraverted feeling, which is mainly concerned with the feelings of others and how well everyone is getting along. Since it’s inferior, an INTP’s greatest source of stress would be tension in a room. And his reaction to that would be to do everything in his power to create harmony. Sherlock clearly does not do this. Ever. INTJs are infamous for their lack of concern for anyone’s feelings. It's not that we’re actually sociopaths, incapable of understanding human emotion, it's just that we don't think what we say should bother anyone. It wouldn't bother us. And we often don't realize what we've done--if we realize it at all--until it's too late. So if an INTJ friend hurts your feelings, have compassion. We don't often know what we're doing. This is 100% INTJ. From the sensorial appeal of the actual gunshot to the shocking-anyone-around-just-for-kicks factor to the all-consuming boredom without a real, physical case to focus his attentions on, this response literally screams INTJ. INTPs want a lot of friends. They want to be at peace with people. They want connection: to be valued and understood. But Sherlock has never wanted friends. Sherlock doesn’t even really have friends--he has John. Up until this point, Sherlock has never found anyone worthy of worrying about, caring about, expending energy on. Then suddenly this grumpy old hedgehog of an Army doctor comes along and proves to Sherlock over and over again that he's interesting, he's talented, and, most of all, he's sticking around. So, despite himself, Sherlock starts to trust him, starts to care about him. And bada-bing bada-boom, Sherlock has a friend. Finally. Even though he didn't really want one. He says himself, he never expected to be anyone’s best friend. That is 100% INTJ. Have I convinced you Sherlock is an INTJ? Feel free to argue with me in the comments!